Perennial. Zone 1. Montiaceae – Montia Family – formerly Portulacaceae. Native to western North America, widely occuring in subalpine and alpine meadows from the lower half of British Columbia south to New Mexico. 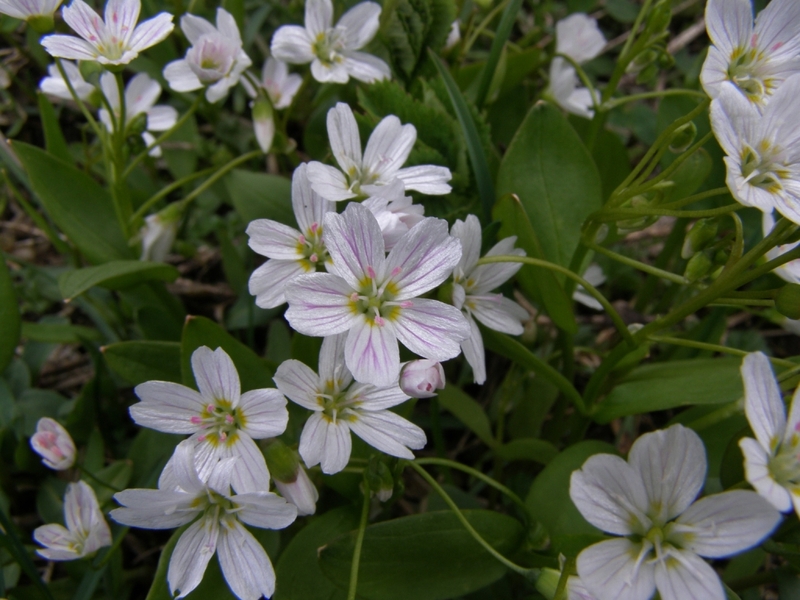 The generic name Claytonia is after 17th century English botanist John Clayton, who collected plants in North America. Lanceolata refers to the shape of the rather fleshy, lance-shaped, paired leaves. Also known as INDIAN POTATO or MOUNTAIN POTATO, for its importance as a First Nations food crop. British Columbia is a place of astonishing biodiversity, and one of the most fascinating aspects of this botanical richness is just how many of our native plants were foraged for and cultivated by the local indigenous peoples. 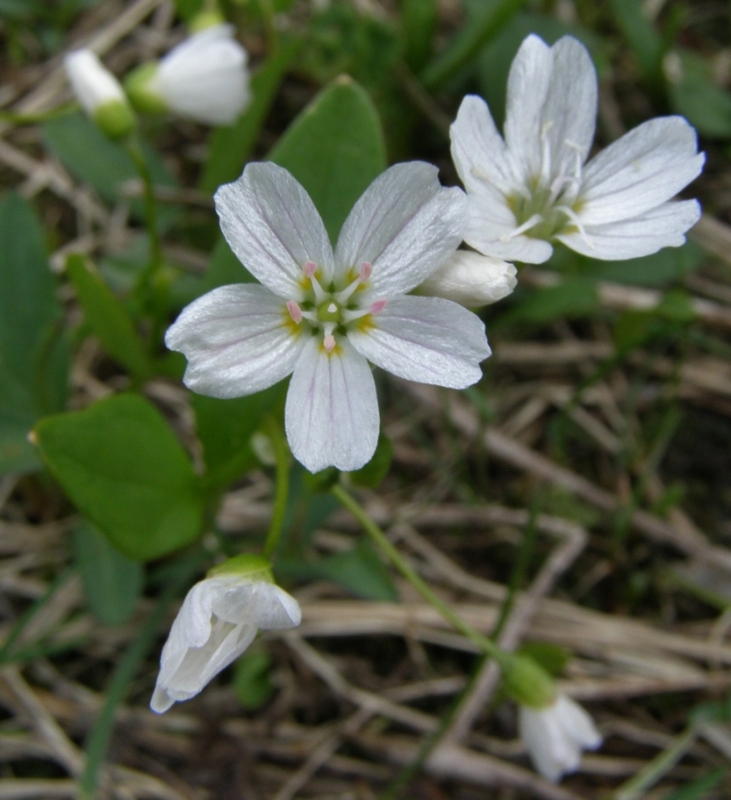 Claytonia lanceolata, abundant in certain areas of the Cariboo-Chilcotin (in particular in the Potato Mountain range near Tatlayoko Lake on the Chilcotin Plateau) is perhaps one of the most important examples. In earliest spring, as the snow recedes, smooth, lance-shaped leaves emerge from the mountain meadow turf, and Spring Beauty sends up its slender 6-inch bloom stems, topped by clusters of delicate 5-petalled flowers, purest white to ethereal pink. These bloom with such abundance as to turn whole areas white, mimicking the just-vanished snow. Aesthetically beautiful, to be sure, but the plant is more than just another pretty wildflower, for it sprouts from a sturdy bulb, high in starches and sugars, and local inhabitants, human and ursine, found these to be worthy of foraging as the flowers faded and the bulbs reached their peak in energy storage to prepare for summer dormancy. 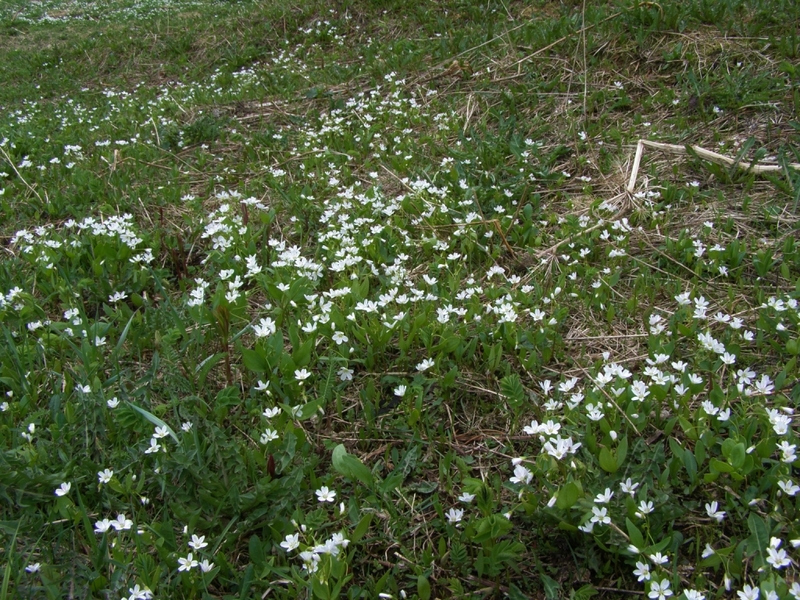 Spring beauties (Claytonia lanceolata) are a delight to the eyes, both from generous carpets in sunny meadows and single flowers up close. The above-ground parts are edible and great in salads. They can also be cooked but I find that they become quite slimy that way. I definitely prefer them raw. But their greatest treasures rest under the ground and fairly close to the surface at that. They have a corm resembling the appearance and taste of small round potatoes and they’re absolutely delicious. To find the largest corms, look closely at the thickness and number of stems emerging from a single spot on the ground. In general, if the plant has at least 4 thick stems, or a least 10 thin stems, then the corm has a good chance of being large. Don’t bother digging up the smaller plants as these are best left to grow for subsequent years! Cook the corms as you would a potato. They also dry very well if you cut them in half while raw or if you mash them and dry them as thin patties after cooking them. Alternately, you can store them in earthen pits or buckets full of dirt to keep them fresh. This plant is a moisture lover, and flourishes in the acidic soils of snow-water seepages in higher elevation meadows throughout our region. An easy-to-access population flourishes beside the road to Wells and Barkerville, east of Quesnel, where sharp-eyed botanists will catch sight of intriguing flushes of low-growing white bloom in May. Though the species is yellow-listed in B.C., as stable and not in danger of extirpation, casual observers should not disturb the wild populations, enjoying them instead for their beauty. However, grizzly bears are under no such injunctions, and they will forage the bulbs with great enthusiasm, which gives further credence to their reputed delectability as a food source. Bulbs are generally quite small, 1 or 2 inches in diameter, but I have read ethnobotanical accounts of the Claytonia lanceolata habitats of the Potato Mountains being subjected to controlled burning in the fall, to decrease shrub and competitive plant growth. In those cases, bulbs as large as a person’s fist were reported to occur. The bulbs are very close to the surface, and are easily harvested. They sometimes grow in conjunction with another lovely ephemeral, the Avalance or Glacier Lily, Erythronium grandiflorum, which was also harvested for its sweet roots. 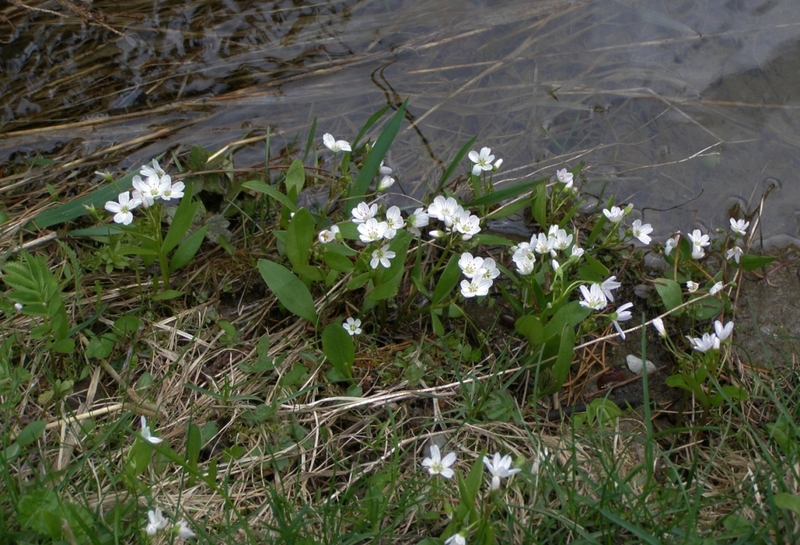 Large quantities of Claytonia bulbs were collected during foraging trips, and were then eaten right away, or processed by cooking and drying, or stored in raw form in deep pits for future winter consumption.